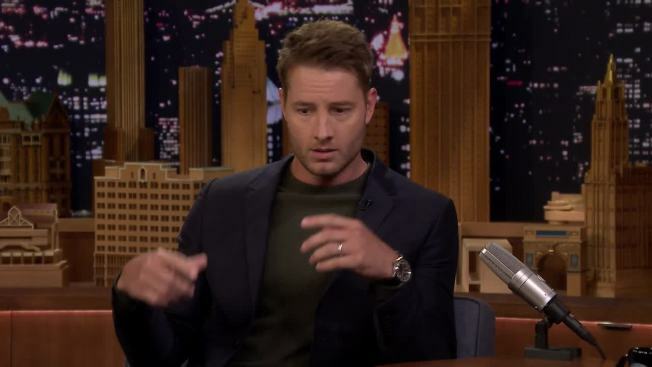 Hartley said he felt the woman should be "ashamed of herself"
He may play a famous actor in his role on "This Is Us," but in real life, Justin Hartley also has to deal with some unexpected encounters as a result of his fame. Recently, however, one of those encounters crossed the line, he said. Hartley, who stars as Kevin Pearson on the hit NBC show, told GoodHousekeeping.com that a fan sexually harassed him while he dined at a restaurant in Chicago. According to the interview, Hartley was with a group of close friends when a fan approached him and started kissing him. Hartley told the publication he backed away and told the unnamed fan to do so as well. "I said, 'You do not walk up to people that you do not know and put your mouth on their face,'" he said in the interview. "'If I did that to you, I would be in prison. Please do not do that.'" Hartley added he felt the woman should be "ashamed of herself." After that, Hartley reportedly said the two "had a little breaking of bread" and the situation seemed to have calmed down before the fan returned to ask for a photo. When Hartley denied her request, he said she called him a "foul" name. It remains unclear exactly when or where the incident took place. Hartley was in Chicago last month along with his co-star and TV dad Milo Ventimiglia, for C2E2 at McCormick Place. Hartley tweeted out while in town that he dined at Prime Provisions on North LaSalle Street and he was later seen taking fan photos at Siena Tavern. A rep for both restaurants told the Chicago Tribune the incident didn’t happen at either location, however. A representative for Hartley could not immediately be reached for comment.